On his Friday program on Fox News, Sean Hannity invited Martin family attorney Daryl Parks on to discuss the aftermath of the Zimmerman trial and verdict. The interview itself was uneventful, with Hannity arguing throughout that Martin was responsible for his own death. However, when Fox posted the video online it featured a cover photo and headline that had nothing whatsoever to do with the interview. The headline was a question, “How Should Trayvon Martin Be Remembered,” that was never asked or addressed in the interview at all. The entire segment was a rehash of the arguments presented in the trial and Hannity’s concurrence with the defense position. Where Fox came up with the notion that Martin’s legacy was relevant to the video is a mystery. 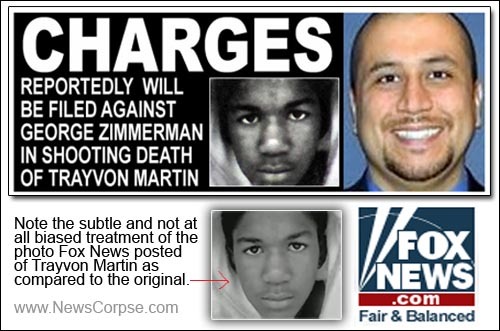 Nevertheless, Fox attached the unrelated headline to a photo that cast Martin in a decidedly negative light with a bullet hanging prominently over his face. That photo was also unrelated, and unnecessarily incendiary, as it did not appear anywhere the video. The purpose of this visual messaging was clearly to implant a memorial image of Martin as inherently violent. This sort of graphic editorializing is nothing new for Fox. Even specifically with regard to this story, Fox News had once posted a photo that they had deliberately altered to make Martin appear more sinister. The obvious racist intentions of Fox News literally scream out at you in both of these photo incidents. They are playing to the emotions of their audience that is predominantly white, with only 1.38% of their primetime viewers being African-America. And that’s why they believe they can get away with this sort of blatant prejudice in the guise of remembering Trayvon. Not only can they get away with it they do get away with it, all the time. It will be interesting to see how the lawsuit being filed by Zimmerman’s attorneys against one of the networks for, as they claim, misrepresenting the facts of the case in some way they feel put a bad light on their client or harmed him in some way goes. If it is successful I would think this could open a flood gate of lawsuits against Fox for all the lies, misrepresentation and disinformation they spew on a daily basis against anyone they don’t like. The obvious dishonesty of Mark comes blaring through once again with this thread. Sean Hannity has stated countless times two things about this shooting and trial: 1) This tragedy happened because of a horrible misunderstanding by both Zimmerman and Martin. 2) The prosecution over-charged. And for some reason, Mark is saying nothing about this protestor actually wearing a BULLETT like it’s a cool piece of jewelry. What kind of a message does that send? Mr. Hannity is blinded by his idealogy,too bad,he could use his voice to bring real change in this country,which is what we really need.Politics aside. The bullett is not being used as a cool piece of jewelry it’s signifying him being shoot. The point is also how they have darkened Trayvon’s face to make him look scary. Now do you understand? 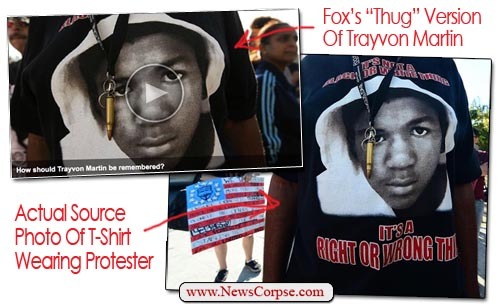 Do you notice that the supposedly darkened photo fox news used looks almost identical in darkness to the photo on the hoodie above? Speaking of cool pieces of jewelry, have you seen the new “Female Hygiene” line at MSNBC?